Information on the first automated switching system - the Step-by-Step (Strowger) telephone switching systems and its variants. The Step by Step switching system was invented in 1888 and patented in 1891 by Almon Strowger, an undertaker in Kansas City, MO USA. Rumor has it that the local switchboard operator was diverting calls from his business to others. He wanted to have some way to have calls automatically routed to the destination without the intervention of an operator. His invention had changed throughout the years, but the basic concept has remained the same. The system operates by using rotating "selectors" that can select a "level" (or step) by the number of pulses that are interrupted on a line (using a "rotary" telephone). This instructed a solenoid to move this wiper (or selector) to a particular position based on the number of pulses it had received. This then put the caller on another level and again pulse dialed to get to another level and so on until the caller had reached the subscriber they were calling on the last level (or digit they dialed). The addition of a line finder selector to reduce the number of switching selectors that were needed (one for every 10 or more subscribers, instead of one for each subscriber). Additional circuitry was later added to add a �tone plant� to provide progress and informational tones such as dial tones, ringback tones and the like. Strowger founded the Strowger Automatic Telephone Exchange Company in 1892. Strowger sold his patents in 1896 and sold Strowger Automatic Electric in 1898. Strowger died in 1902 of a brain aneurism. In 1901, the Strowger Company licensed the technology to the Automatic Electric Company. In 1908, the two companies merged and took the latter name. In 1957, General Telephone (later GTE) purchased Automatic Electric to become their manufacturing arm. In 1989, Automatic Electric merged with the manufacturing arm of AT&T to form the AGCS company (AT&T-GTE Communications). By 1996, AT&T spun off their manufacturing arm to Lucent Technologies along with AGCS. What was AGCS is now Lucent. The Bell System eventually began to manufacture Step-by-Step switches. However, their first installation of a Step-by-Step switch was NOT made by Western Electric, but by Automatic Electric! This first Bell System owned Step-by-Step switch was installed in 1919 in Norfolk, VA. This Automatic Electric-Western Electric arrangement lasted for five years until Western Electric could start manufacturer of their own switches. There were many variants to the step by step. One was called the "XY" switch made by Stromberg-Carlson. This was a two-axis (horizontal & vertical). It was a flat mechanism, and the moving contacts moved both back and forth and side to side. This was considered to be a simpler and cheaper version of the Strowger Step by Step, and was commonly used in rural areas of the mid-western United States. Step-by-Step systems of various styles and manufacturers were in widespread use throughout the entire world. 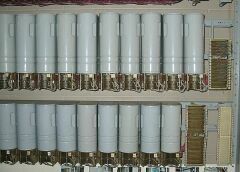 In the United States, the last Step-by-Step switch was removed from service and replaced with a digital switching system in 1999. The last Step-by-Step switch in the United Kingdom was replaced in 1995. In Canada, the last Step-by-Step switch in the North American public switched telephone network was replaced in 2002. Outside of North America and Western Europe, there may still be in use in some small third-world countries and former Soviet controlled countries in Europe that may still be using these systems. Note: A number of these companies made Step-by-Step switches with licenses from Western Electric or Automatic Electric.